(a) Remove the 4 bolts and 4 compression springs. (b) Remove the exhaust pipe center from the 4 exhaust pipe supports. (c) Remove the 2 gaskets from the exhaust pipe front No. 3 and the exhaust pipe center. (a) Remove the 4 bolts and heat insulator. (a) Disconnect the VSV connector for CCV. (b) Disconnect the fuel emission hose. (c) Disconnect the air inlet line hose. (d) Disconnect the fuel tank vent hose. Push the connector deeply into the charcoal canister assy to release the locking tab. (e) Remove the 3 nuts, and then remove the charcoal canister. (a) Install the charcoal canister with the 3 nuts. (a) Install the heat insulator with the 4 nuts. (a) Using a vernier caliper, measure the free length of the compression spring. If the free length is less than minimum, replace the compression spring. (b) Install 2 new gaskets to the exhaust pipe front No. 3 and the exhaust pipe center as shown in the illustration. 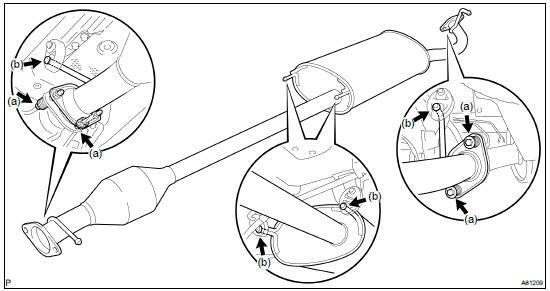 (c) Install the exhaust pipe center to the 4 exhaust pipe supports. (d) Install the 4 compression springs and 4 bolts. If gas is leaking, tighten the areas necessary to stop the leak.